Updated April 15, 2016: Further information received from the Infrastructure Canada has been incorporated, as noted, in this article. Decisions about which projects should be funded with federal dollars will rest with local agencies rather than being dictated by Ottawa. Federal funding will pay for up to 50% of projects compared to previous schemes in which each level of government contributed 1/3 (e.g. the Vaughan subway extension). The pool of funds will be distributed based on ridership, not on population, so that provinces with well-used transit systems will receive most of the money. That will be a challenge on a few counts. The TTC’s Capital Budget for 2016-2025 includes about $2.7-billion in unfunded projects, but some of these are not planned to start, indeed are not even required, in the immediate future. The table above (from the City Budget Analyst Notes) shuffles around a bit every time we see it, but the outline remains the same. The serious problem with capital funding begins in 2018 when the City’s headroom for additional borrowing (in the absence of some other scheme to finance its capital programs) will be exhausted. The $55.4m shown for 60 additional streetcars may or may not actually be triggered as a 2016 expense depending (a) on how many cars Bombardier delivers this year, and (b) on how much Toronto trusts Bombardier with an add-on order when the base contract is running so late. Most of the list above deals simply with replacing or repairing vehicles and infrastructure that are at the end of their natural lives, and only a small part of the total (99 buses, 60 LRVs) would actually bring more service and capacity to the system. Toronto has not shown much enthusiasm for funding additional operating costs that a larger fleet represents and persists in the belief that ridership growth can somehow be handled by “efficiencies” within the base budget. Another problem, of course, is that if $2.7b is “below the line” in unfunded status, and Ottawa is prepared to contribute only 50%, then the remaining 50% still has to come from somewhere, likely from the City of Toronto which claims to have no ability to finance this spending. The main section of the Crosstown from Mount Dennis to Kennedy is fully funded by Queen’s Park, as is the Finch West LRT from Finch West Station to Humber College. The Crosstown East LRT is to be funded through a shuffle of available money among Scarborough transit projects. It is not yet clear whether changes to SmartTrack and the Scarborough Subway Extension will actually balance out the LRT’s full cost. The Crosstown West LRT would, in theory, be funded from “savings” through the cutback of SmartTrack to Mount Dennis, but ST itself is not fully funded or costed. How much will actually be available remains to be seen, especially when Queen’s Park’s share will only be an “in kind” contribution through GO-RER upgrades. The Finch West LRT extension to the airport, the Crosstown extension north beyond UTSC to Malvern, and a Sheppard East rapid transit line have no funding. Ottawa’s budget papers describe the commitment in more detail, and beg a few questions about just how much help Toronto will get for its infrastructure funding problems. The government has a “plan to invest more than $120 billion in infrastructure over 10 years”. That will be quite a feat when the chart for actual spending never exceeds $10b/year and is well below that amount in the early stages. Updated: According to Infrastructure Canada, the chart above does not include all classes of proposed spending, and that’s why the total value of the columns is less than the $120 billion cited in the text. In other words, some of the $120 billion is “old money”, and some of it lies in areas outside of the scope of the infrastructure announcement. It’s a lot of money, but not quite as big a pot as some might have thought specifically for the transit, green and social infrastructure envelopes. $3.4 billion over five years for social infrastructure, including affordable housing, early learning and child care, cultural and recreational infrastructure, and community health care facilities on reserve. It is not clear how much of the $108.1 billion in the later years would go to public transit, but if the split were on the same basis, then transit would get about $30.9b, Ontario would get $13.6b, and Toronto would get $8b. Updated: The reason for the mix of three and five year periods for the three funding envelopes is that there is no transit money in years four and five in the “phase 1” spending. The detailed breakdown shows how this works. “Phase 2” is not included in this table, and that is the phase in which major projects (as opposed to catch-up on state of good repair) will occur. Clearly it is intended that the two phases will overlap. The total of “Toronto” money could be less than the amount originally estimated by me above ($8b) because the total pot from which “transit” spending will be drawn is smaller than $120b as explained in Infrastructure Canada’s email. If this all goes to fund “below the line” projects, someone has to come up with a matching amount for the local and/or provincial share. Queen’s Park pleads poor and points to the massive investments underway already on GO/RER and other projects, notably the Crosstown LRT line. Toronto says that its borrowing capability is tapped out. A common phrase used when politicians talk of infrastructure and economic stimulus is “shovel ready projects”. Toronto has some projects that are comparatively close to construction, provided that someone wants to pay for them, but detailed design will soak up a few years before there will be any ribbon-cutting in front of a real construction site. Stimulus, such as it might be, from these projects will occur at best in time for the next election, with the bulk of spending to follow. 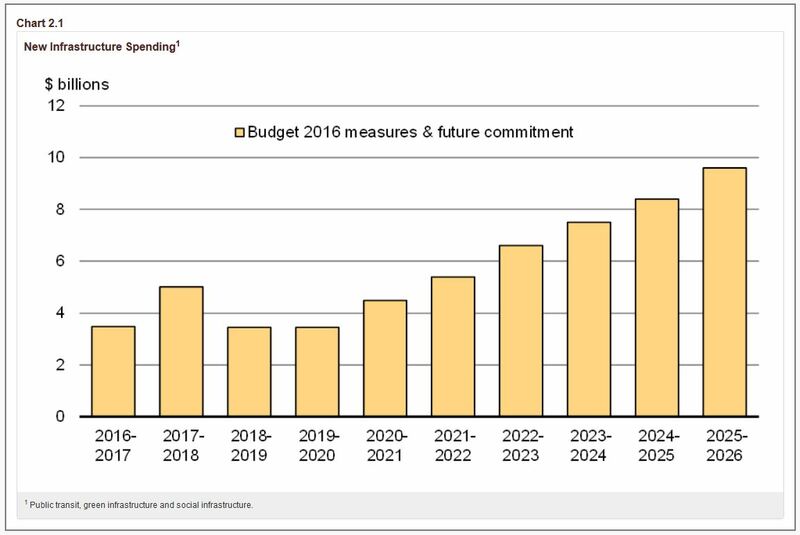 Indeed, the staging shown in chart 2.1 above pushes the bulk of the spending beyond 2020. As mentioned above, if Ottawa pays 50%, then someone else, probably Toronto, must pay the rest, and this would shift Toronto capital spending into a period when the City is hard against its debt target unless new local revenues are found. Some projects, although included “above or below the line” in TTC plans, can be “nice to haves”, not “must haves”. Advancing spending on them because they easily fit the desire to make work “now” may give them an undeserved priority in the unfunded project list. The largest example of this is a group of projects to increase capacity on Line 1 (YUS), something that should not be launched without the context of a Relief Line’s future effect. One good aspect of Ottawa’s new plan is that unallocated money at year-end will not be clawed back to help with the federal deficit problem, but will be used to top up funding that now flows through federal gas tax contributions. The government claims that it will not be prescriptive about the new funding, picking and choosing projects to best suit their own political ends. If they can resist the temptation to build more “Scarborough Subways”, this will count as a small miracle in the evolution of federal transit support. However, new money cannot be dispensed without strings, of which the most important is a need to ensure that Ottawa’s money doesn’t simply offset cuts in City subsidies for transit. We cannot dig ourselves out of the transit infrastructure backlog if we simply redirect money that might buy a new signal system to rebuilding an expressway. This was always a concern at Queen’s Park in the days of open-ended Provincial capital subsidies – that Toronto would simply use the money to save on spending from its own account. Lurking in the background will be Queen’s Park and their agency, Metrolinx, always hungry for contributions to GO’s service expansion. The new federal money is supposed to be allocated by ridership, and GO’s is only a small slice of the TTC’s numbers. Will they be able to keep their hands out of the cookie jar and allow the money to flow to municipal transit systems? Identify projects that should be moved “above the line” in the budget, or be brought onto the books from the extended wish list. Prioritize new projects in the rapid transit plan, and engage in the hard discussions about exactly what the City’s needs might be. Pet projects need not apply. Determine how Toronto will pay its share of projects that, until now, were not part of the City’s capital program. Accept that some projects will have operating cost and subsidy implications. There is no point in buying vehicles if the City won’t pay to operate them, and to expect that service can be improved at no net cost is pure fantasy. Funding announcements are always a time for gatherings before the media, lots of smiles and back-patting among political colleagues, but the hard work comes in deciding how best to spend new transit dollars while they are flowing. Friday, April 8 brought one of the more outlandish examples of re-announcing old funding for transit when MP Adam Vaughan and other worthies gathered at Main Street Station to celebrate the coming of Presto and the new fare gates. Vaughan noted that Ottawa had helped to fund this, but neglected to mention that the original commitment, $46.7 million, was made under the Paul Martin government in 2004. The money no doubt vanished into the black hole of Presto development years ago. Any other federal funding would be an accounting exercise of allocating a portion of gas tax revenue explicitly to the TTC side of the project. This is an example of the “catch 22” in generic funding: Queen’s Park and Ottawa have some money on the table, but they are minority partners in funding the TTC’s general capital needs. The April 8 Presto event was not a new funding announcement. It was an event to mark a significant milestone in the Presto project with our project partners. The milestone was the installation and full functionality of new fare gates at the Main Street Subway Station and the upcoming installation of faregates at the primary entrances of the 42 remaining subway stations that are not yet PRESTO-enabled by the end of 2016. Yes, the question is where is the cut-off. I had said once in virtually every signal cycle (every 3 minutes or so) of which there are a goodly number – I believe that say on Finch east that would be 2 per cycle for instance. There are however, a lot of routes where they are nowhere near. I would be tempted to start with the routes that are busiest, that very nearly deserve (or do, but we are not about to) LRT, and work our way down. Making these BRT, would be better still, as it would hugely improve travel speeds, and as such, transit demand. Steve: Note that signal cycles are shorter than “3 minutes or so”, commonly under 2 minutes particularly in older parts of the city with narrow streets. 180 seconds is a cycle time that will frustrate pedestrians and lead to much j-walking, especially where streets are only four lanes wide. Yes, however, I am actually looking at this mostly for the outer areas, beyond the core. Clearly in core yes the signals are quite short. However, in many areas there are already street cars. Hopefully wheelchair access compliance will be accelerated. Toronto is cutting it really close on the legally mandated schedule as it is, leaving no room for delays. Trudeau offers up to $840m for transit fixes in Toronto. “Signal upgrades, new buses and full accessibility are some of the projects ready for funding”. The CBC reports: “Toronto Mayor John Tory said the cash infusion will help ensure that the transit system is reliable, efficient, modern and safe. Signal upgrades on Line 2, the Bloor-Danforth line, not only mean more reliable service by reducing break-downs and delays, Tory said. More trains can be added to the line to move more people, the mayor added. I am sure that the TTC can easily spend all this money on SOGR projects but I thought that adding ATC to Line 2 was not worthwhile until we get new trains. Also Tory says “new buses” not “more buses” and we really need both. It will be very interesting seeing where “we” will actually invest this money. Steve: Some of the distortion in priorities is that replacing the T1 fleet and having ATC capability are pre-requisites for the Scarborough Subway. If not for that project, they would be done later, but it forces them to move ahead in the priority sequence. Meanwhile, other stuff we may need more is deferred. As for new buses, the TTC has been driving up its spare ratio in the hope that this will allow better maintenance and reliability, but the question re the stats is this: is the “reliability” better because the average age of the fleet is lower, or because it is better maintained? The TTC does not break out reliability by groups of vehicles and so we cannot see whether old buses actually are more reliable, or it is simply the presence of younger vehicles improving the numbers. Meanwhile, with a higher spare ratio, many of the new buses have gone to the garage spare pool, not to service. Spend some of that cash on a new AVL/CAD system so the TTC has one less excuse for its horrid dispatching issues. Maybe some newfangled European track switch technology that actually works. Steve: Both of those projects are already funded. It took several years of CAD/AVL sitting in the project list to get approval, but now the project has been launched. As for track switches, the TTC endlessly has been designing and testing a new system. Why they just don’t buy one off the shelf is a mystery, and I have not yet received a straight answer on this.